From Pulitzer Prize finalist Mark Di Ionno comes the next Great American Novel about the Great American Pastime—The Natural with echoes of Ford, Updike, DeLillo and Roth—two men from disparate worlds and their search for what constitutes a meaningful life in a searing portrait of honor and masculinity, sport and celebrity, marriage and parenthood. Joe Grudeck is a living legend—a first-ballot Hall of Famer beloved by Boston Red Sox fans who once played for millions under the bright Fenway lights. Now, he finds himself haunted by his own history, searching for connection in a world that’s alienated the true person behind his celebrity facade. He’ll step back into the spotlight once more with a very risky Cooperstown acceptance speech that has the power to change everything—except the darkness in his past. Horace Mueller is a different type altogether—working in darkness at a museum blacksmith shop and living in a rundown farmhouse on the outskirts of Cooperstown, New York. He clings to an anachronistic lifestyle, fueled by nostalgia for simpler times and a rebellion against the sport-celebrity lifestyle of Cooperstown, struggling to bring his baseball prodigy son to his side. 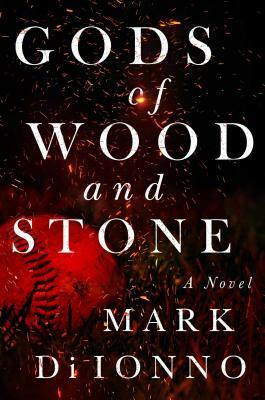 Gods of Wood and Stone is the story of these two men—framed by the lens of baseball, a timeless, but strikingly singular tale of the responsibilities of manhood and the pitfalls of glory in a painful and exhilarating novel that’s distinctly American. Mark Di Ionno is the latest to bring our national pastime to the printed page with his novel Gods of Wood and Stone… And what a narrative it is, a story of relationships and disappointments, about the regrets that haunt us and the damage caused by the decisions we make… Narrative, characterization, dialogue–Gods of Wood and Stone is outstanding in every respect. It is thematically complex and emotionally challenging, a compelling as hell story with thoughtful ideas that just happens to be exquisitely readable… If I were inclined to clichés, I’d call it a home run. Instead, I’ll call it exceptional.